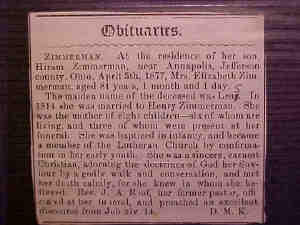 Elizabeth's obituary reads: "Mrs. Elizabeth Zimmerman, wife of John Zimmerman, deceased, died at her residence near Annapolis, this county, April 5th, aged 81 years, 1 month, and 1 day. Mrs. Zimmerman was born in Adams County, Pa. March 4, 1796. She was married to John Zimmerman March 14, 1814. On the 14th of the July following she with her husband removed to this county, where she has resided up to the time of her death. She from early childhood has been a consistent member of the Evangelical Lutheran Church. She was the mother of eight children, six of who still survive her, three being present at her funeral. The friends of the deceased have the sympathy of a large circle of friends and acquaintances." 2 The place of burial was provided by Lance D. Gill. Mr. Gill indicated that Elizabeth and her husband John are both buired in the "Leas Cemetery". 3 Burial place provided by Lance D. Gill. He indicated that John and his wife Elizabeth are buried in the "Leas Cemetery."